- Import file must be in a CSV format. 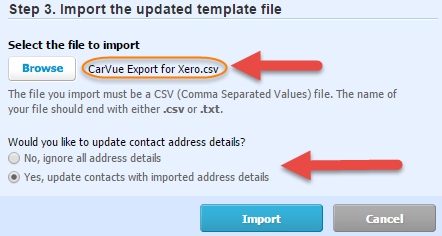 The following is an instruction on how to import invoices from CarVue into Xero. Because we already have the template and have exported the information from CarVue there is no need to carry out steps 1 & 2 from the guide, instead go straight to step 3 and click Browse to search for the file which you wish to import. As default files exported from CarVue are saved in Downloads folder but at the point of export it is possible to save them in an alternative location. File has been chosen and will show as the chosen file to import. 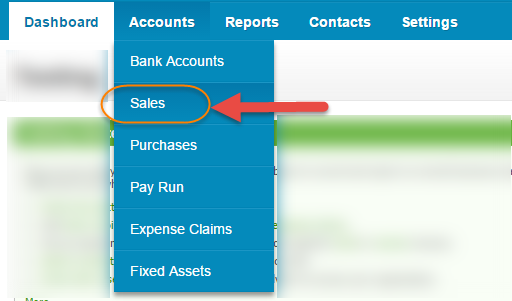 Choose Yes to update the contacts, if you do not require to update the contacts within Xero then choose No. Clicking Import will show an inventory of what will be imported, will also show if there are any lines which will fail to import which you can rectify before importing. Confirmation of the import will show. The new imported invoices will show as draft invoices where they can be progressed within the Xero application. Now the draft invoices have been imported from CarVue you can now go and invoice your customers.